Yes, this is a revamp of a Last Kiss comic I did years ago. I’m running it so that I have time to go on a family vacation (with my wonderful wife.) No sharks involved…I assume. Inks by Sal Trapani from the “The Ugly One” in FIRST KISS #23, 1961. 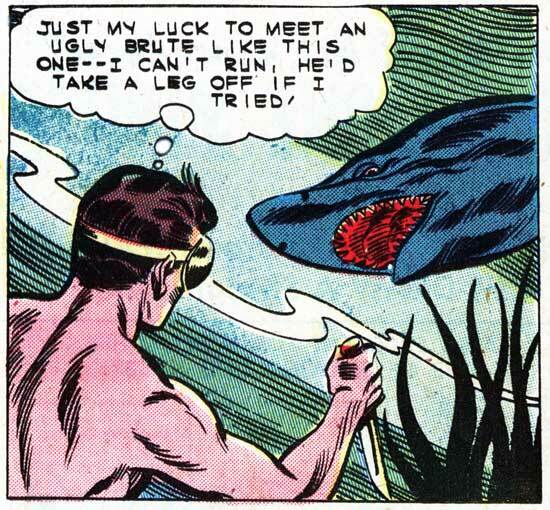 SCENE: Knife-wielding swimmer is below the water line about to confront a hungry shark. MAN: Thank God! It’s just a shark. For a moment, I THOUGHT it was my ex-wife! MAN: Thank God! It's just a shark. For a moment, I THOUGHT it was my ex-wife!